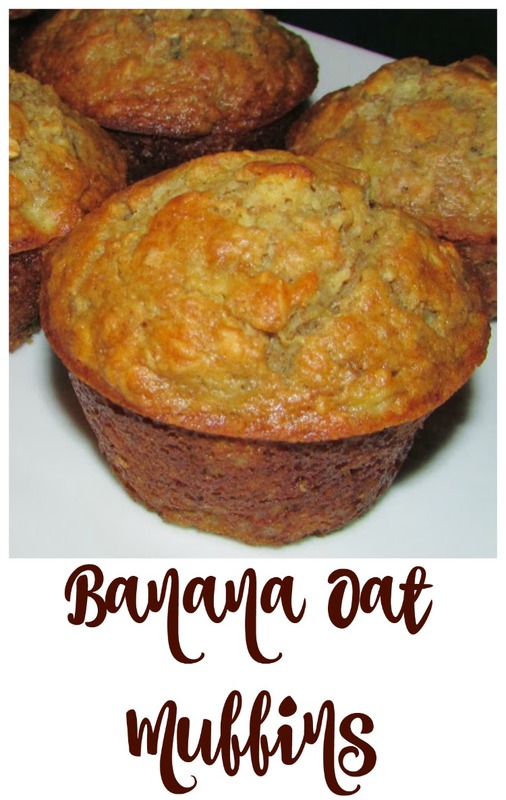 Whether you are looking for a grab and go breakfast or something for a leisurely weekend brunch, these banana oat muffins are perfect! With Nana's wedding last weekend, we had some extra bodies in and out of the house. I wanted to have a quick grab and go breakfast available to anyone who was hungry, but I didn't have a ton of time to put things together. So as I was getting ready for the luncheon, I threw a batch of these in the oven. They are healthy enough you don't have to feel bad about eating one, but still taste really good! 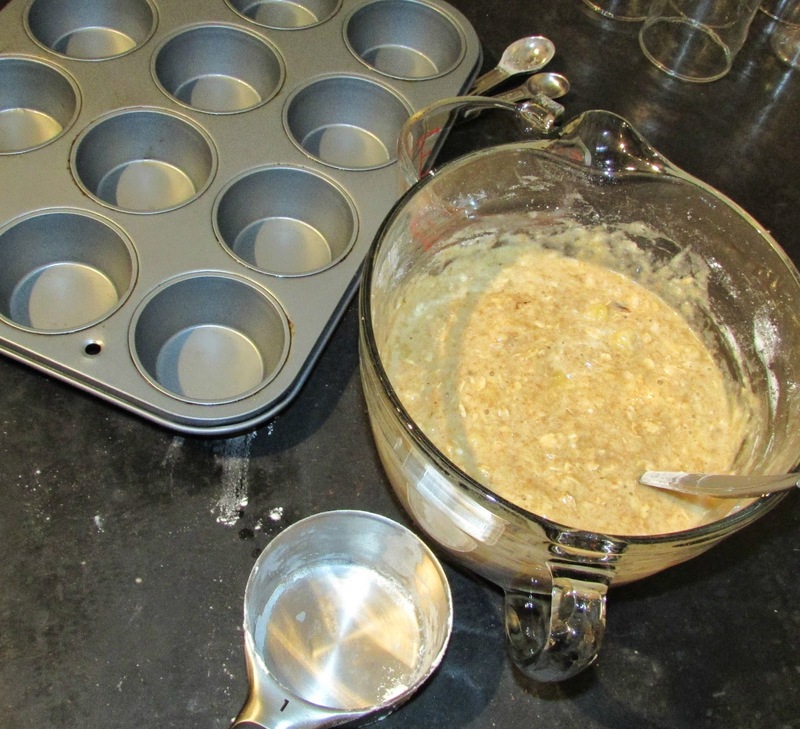 You might think the whole wheat flour and oatmeal would make for a denser muffin, but you would be wrong. These came out light, moist and delicious! The ingredient list looks a little long, but I had them in the oven in less than ten minutes. Breakfast was ready by the time everyone else woke up! In a large bowl, mash the bananas. Then stir in the eggs, milk, oil and vanilla. Mix in the oatmeal and cinnamon next. You can mix the rest of the dry ingredients in a separate bowl if you like, but I didn't want the dirty dishes. So, I just put the flour on top of the wet ingredients, put the baking soda, powder on salt on top of that and kind of stirred it together. Then I mixed in in with the wet ingredients underneath. 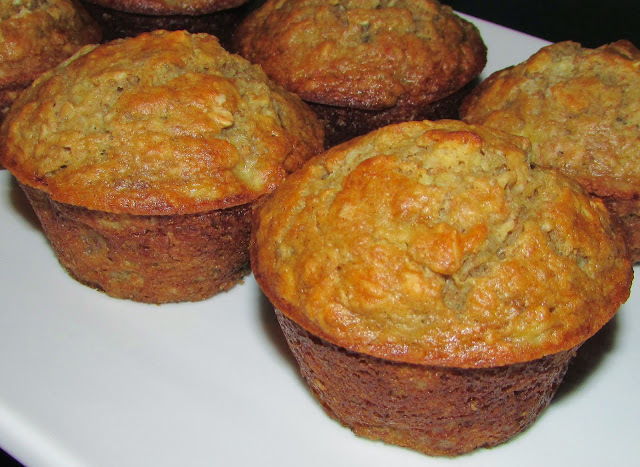 Spoon into a greased muffin pan, or one lined with papers, and bake for 18-20 minutes. Hi Carlee, I like using olive oil to my baked goods, rather then butter. 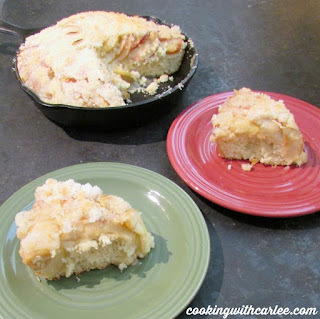 It has a way of making the baked goods taste better, seem lighter, healthier. I just happen to have two overly ripe bananas I was looking for just the right recipe to make. Can't wait to try yours! Have a great weekend! I hope you guys love them. I am always looking for tasty ways to sneak good foods into Jax, and he kept calling these "my treat" so I'd say it was a winner! Have a great weekend. These looked delicious, but I was too busy eating the luncheon food to try one. I'll have to get Anthony to make me a batch! I should have sent some home with you guys! I saw you put up a new post, but haven't been over to read it yet. I'm curious to see what it is. YUM!!! I was just looking at my bananas, thinking I needed to make something with them. Now I have this recipe - thanks!! 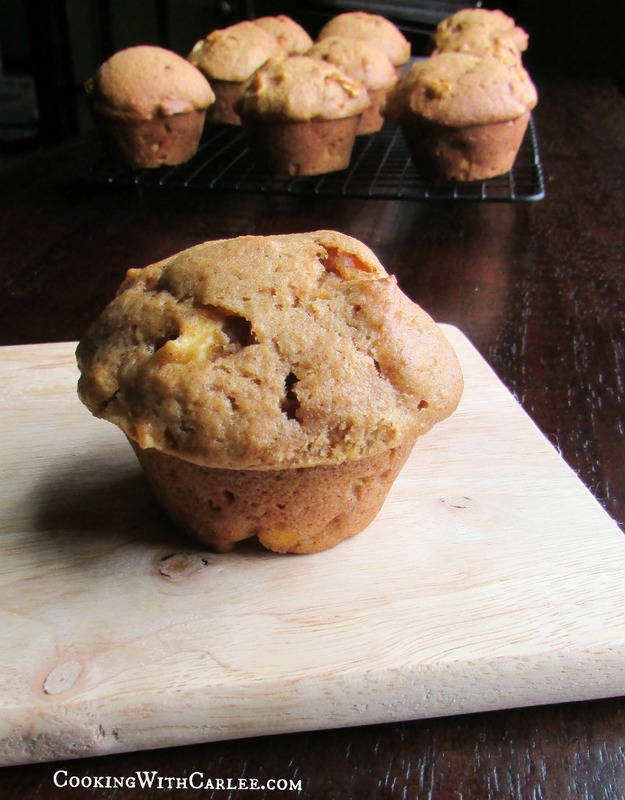 I have been saving up some bananas now I have the inspiration to make some of these muffins. Thanks. They look so yummy! Thank you, I hope you love them as much as we did! Thanks! I love making treats you don't have to feel bad about eating. See you Friday! I like this variation of adding oats.... now if these green bananas would just hurry up and rippen! Isn't it funny how they take forever to ripen if you want to bake with them and ripen in an instant if you want to have them around for a while?! I hope you love these muffins. Thank you, I hope you enjoy them as much as we did! These muffins sound so good! I love having these sorts of grab and go treats when we're having visitors. Thanks for sharing at What'd You Do This Weekend?! It is so nice to have something to offers as people come and go! Thanks for hosting. Your Banana Oat Muffins look and sound delicious. I wish I had one right now to go with my coffee. Thank you for sharing with the Clever Chicks Blog Hop! I hope you’ll join us again next week! I have three bananas on the counter waiting to be used up...this recipe is perfect! Thanks for sharing!! I would love it you shared it on the new Our Simple Homestead Blog Hop! I hope you enjoy them as much as we did! I will stop over, thank you! I have these baking right now and they are making my house smell wonderful! Thanks for adding it to this week's Our Simple Homestead Hop! Hooray! I hope you love them! I hope you enjoy them. Bananas don't tend to last long around here, so it is a treat when they get good and brown and ready for baking! Thanks for hosting and stopping by! Pinned! I go to BJ's and pick up a bag of banana's for 1.29. It's such a great buy I can't resist! I'll be making these soon. Thank you! I buy bananas every time I am at the store, I can't help it! I hope you love these. I definitely need to do my banana bread that way too. I just love oats in baked goods! Gorgeous, Carlee! Happy THrowback THursday! !